What is Auth Code 14, declined? 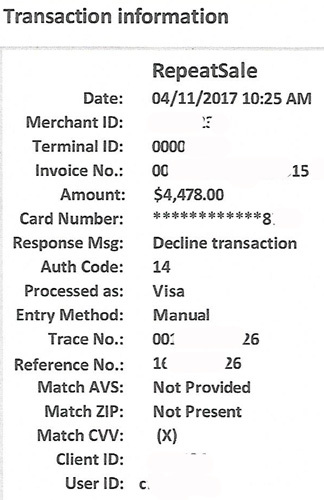 A credit card processing response of Auth Code 14, is a decline for Processor Declined, Fraud Suspected. Why does this happens for recurring billing, including unscheduled recurring billing using a stored credential, also known as a token on file? The method used to store the first transaction, and process subsequent transactions can impact authorization approvals. For example, a merchant has successfully processed unscheduled transactions using a token on file since 2016. However, in 2017, declined for Auth Code 14 appeared. Why would a previously stored and working card decline now? Look at the AVS, ZIP, and CVV response above. Compare to the example below. 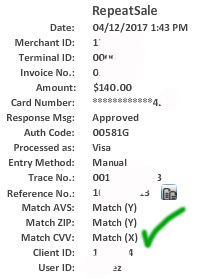 For the second receipt, AVS match Y= address and 5 digit zip match, Zip match Y=Address and 5 digit zip match, CVV = match X, cannot verify CVV. 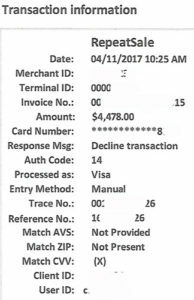 Because CVV was verified a match on the initial zero dollar authorization it’s not required to be presented on subsequent transactions. The first example is returning that information does not match, thus the reason for suspected fraud. Without looking at the very first authorization when token was created, several possibilities exist, including cardholder issued a new chip card with same number but other changes occurred in the interim; cardholder address changed or was never validated. Merchants are at risk of issuer initiated chargeback if authorization rules are not followed. Refer to Visa Product and Service Rules, Table 5-21: Requirements for Prepayments and Transactions Using Stored Credentials for more information. With recent rules changes, and more coming October 2017, merchants need a cloud based solution that can automate compliance. Not all of them have that intelligence. For example, some cloud based payment gateways enable merchants to perform prohibited transaction requests that put the authorization at risk of chargeback for non-compliance. Due to many recent and upcoming changes for card absent and recurring billing with stored credentials, merchants are advised to review processes to include empowering customers to self-manage adding cards on file, and using cardholder authentication. Visa requires Verified by Visa for cardholder authentication in a card not present environment; without it, expect increasing declines. Disclaimer: The rules of card acceptance are very complex and change typically twice a year, sometimes with interim bulletins regarding more changes. Merchants should read the manual for complete details regarding card acceptance for your business type. Christine Speedy, authorized CenPOS reseller, provides universal payment processing solutions, including cardholder authentication, to maximize merchant profits and mitigate risk across multiple sales channels. Contact Christine at 954-942-0483. What is Auth Code 51, declined? This entry was posted in Credit Card Authorization Form, fraud protection, Payment Gateway, recurring billing, virtual terminal and tagged decline, stored credential, token billing, visa by Christine Speedy. Bookmark the permalink.